“A showcase of sculpture in motion” is the subtitle of this exhibition. Except…it wasn’t. Well, I know that it was on opening night. And it will be again at some point, I’m sure. But it wasn’t on the day I went to see it. But in fact, the fact that these sculptures are united in not moving is no less intriguing. 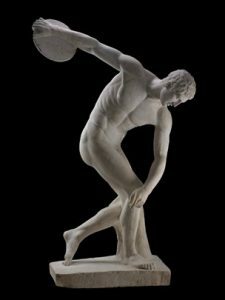 The ability to capture a sense of movement within sculpture is as old as the art of sculpture itself – it was one of the qualities most admired by the Ancient Greeks and Romans in sculptures like Discobolus. So it’s unsurprising that this is a concept inherent in the contemporary sculptures featured here. But the sense of what “motion” means has also been transported into the modern world. In traditional marble or bronze sculpture, the concept of motion rests entirely in the figure. As spectators we are passive, simply looking on in the fantastical expectation that they could come to life as active agents. These sculptures are different: they cannot achieve their potential without being acted upon. As an audience, we are not just observers but essential parts of the experience. This is exciting, and creates a range of new possibilities for action. It makes me feel that childhood sensation when you wanted to touch something you’d been told not to, just to see what happens. They make you ask “what if..?”. This sense of childishness is most obvious in the work of Charlie Cook. A tyre at the top of a ramp, a set of balloons along the way – what could possibly go wrong?? It’s in the works of Molly Mae Whawell and Beata Wrobel, that the answers to “what if..?” seem closest at hand, as their objects are those closest to everyday experience. But there’s also something which feels quite delightful, maybe even transgressive, about putting them in an art show. This kind of experience is becoming more common (Tate have played with different levels of movement in both Liverpool and London in recent years), but it still feels like a shock to the artistic environment to be able to climb up a hill as Whawell’s work makes possible. Wrobel, meanwhile, writes in the exhibition notes that her work is often about dreams, which seems entirely appropriate for her chair. It looks not only wonderfully comfortable, but extremely private and sheltering. You imagine that if you chose to sit down, it might be a long time before you got back up – a perfect place to relax and get lost in your thoughts. Callum Johnstone’s strange caravan meanwhile, encased by irrigated mushroom-growing pots, asks the question “what if..?” in a different way. Rather than referring to an immediate event, Johnstone’s making us think long term long-term. 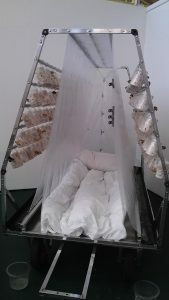 How would it work if we really did grow food in our homes? What if we did radically downsize to the scale this work suggests? It would be fair of you to ask why I chose not to interact and set any of these sculptures into motion if that’s what they’re here for? Today, I preferred the magic of the potential: imagining the “what if..?” of what the sculptures could become. And Yet It Moves playfully, preciously, shows that a ‘moving sculpture’ isn’t just about spectacle, but also the sense of magic in the moment before: the promise of potential. 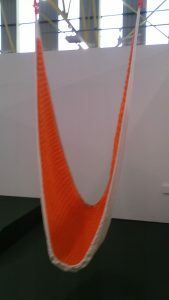 This entry was posted in Exhibitions, Home, Past exhibitions and tagged art, culture, Liverpool, sculpture. Bookmark the permalink.